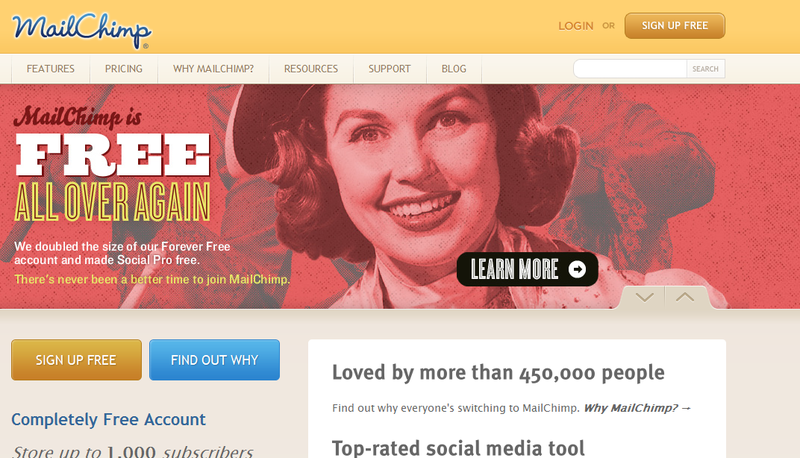 MailChimp Review: Monkey Business or Serious Email Marketing Tool? Whatever your feeling on online marketers, at least don’t call them monkeys. Okay, so I guess we can throw that idea out the window: MailChimp.com‘s choice of branding won’t do much to advance the legitimacy of online marketers. But if you’re an effective online marketer, you might not be able to care much less. After all, what matters online is results. Does MailChimp, pardon the pun, deliver? With email marketing such a huge part of any online marketing campaign – or even many blogs – these days, having a good email marketing platform is, of course, essential. Many people might call you a heretic for avoiding Aweber, but sites like MailChimp look to make a dent in the email marketing master’s chokehold on the market. To really knock a few marketers loose from the Aweber grip, however, MailChimp really has to stand out. Does it? In this MailChimp review, that’s exactly what we’ll be asking. Okay, so maybe there are plenty of features to keep your busy – you can find their full list here. While there’s nothing terribly groundbreaking about any of the features at MailChimp, the simple functionality of many of the features and the wide array of possibilities make it an excellent contender for your email list manager of choice. The fact that you’re able to manage and create unlimited subscriber lists alone should push MailChimp to the top of your list. No list of features is complete if you’re not talking about pricing. Great features are great, but if they cost $1,000 a month, you’ll probably want to reconsider. Luckily, a basic membership at MailChimp will cost you a thousand bucks less than that – free! MailChimp’s “Forever Free” plan allows you to use the basic features and manage a list of 1,000 subscribers and up to 6,000 emails every month without paying a dime. That’s excellent news for the beginning blogger, but it’s no major surprise if the serious online marketer requires a little more horsepower. The pricing is very flexible. You can select a pay-as-you-go pricing model which you’ll see a screenshot of below. That picture could probably double as an eye exam, so here’s a link to the more detailed pricing plans at MailChimp. Other plans work based on how many subscribers you have each month and, unsurprisingly, a lot of subscribers means that you’ll be paying a lot more. Hey, you get what you pay for, right? Expect to pay over a hundred dollars if you’re maintaining tens of thousands of subscribers. At least it’s a good problem to have. Once you break over the 150,000 subscriber mark – you’re doing well, by the way – MailChimp simply asks you to contact them. But if you’re just starting out with a small blog, the pricing won’t be a big deal for you. If you’re a professional with a large list to maintain, you will want to make sure and properly weigh MailChimp’s features and pricing against other similar platforms including Aweber. What separates MailChimp from the crowd? The more popular email marketing becomes, the more sites like MailChimp we’ll see popping up. So it’s not a major leap to wonder why MailChimp should be your choice over other services like Aweber. What exactly does separate MailChimp from these other companies, and do these differences justify subscribing with MailChimp? First, the analytics integration have to be considered a nice plus. Switching to MailChimp and running A/B tests and analytics without using outside platforms or software is a great way to keep your email marketing simple without losing the functionality that an online marketer might demand. MailChimp’s free service is also a great bargaining chip with people who are just starting out with their listbuilding and want all of the functionality with none of the price. Heck, in today’s day and age, it’s not a lot to ask for you. On its site, MailChimp also offers easy integration with sites like Twitter as a reason you’ll want to make MailChimp your emailer of choice. I haven’t been able to check out this integration for myself, but if you can really link up your emails with sites like PayPal and Eventbrite with relative ease, you’ll find a lot to like about MailChimp. MailChimp is the kind of service that I’ll keep bookmarked so that I can send it to friends who are wondering how to get started in the world of listbuilding. It’s easy, intuitive, not difficult to set up, and having a relatively small list is easy to manage without paying anything. In this day and age, it’s important to avoid credit card charges on the web whenever possible. When your list grows up to around 1,000 subscribers, at least you’ll have a quality problem. Cross that bridge when you come to it. For the more advanced marketers, a closer look is warranted. The pricing plans look fair but if you can find a cheaper service with the same reliability, there might be no reason to stick with MailChimp over any other type of email list manager. You’ll probably be able to access the other functions MailChimp offers with other email platforms. But that’s not to say you should discount MailChimp completely: it’s a perfectly worthy addition to your “sites to check out” list. And, heck, we already know you’re good with lists.